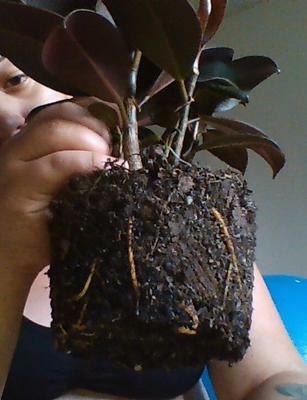 Hello I have more than 1 question: I just bought my first ficus elastica black burgundy. I've only had it for a week and it has started to drop leaves. 2 of the leaves that fell have these flat white circles underneath. The best way to describe these markings are like wax drippings. It looks like tiny bits of hot wax dried on the leaf. For sure it's not a bug or any kind of bug eggs, but I can't seem to find anyone else online who has seen this before. I'm wondering if my plant may just be in shock from being moved or if I'm doing something wrong. I live in Denver which is quite dry. I keep the pot over moist rocks for humidity and lightly mist in the early morning. I watered the plant the day I bought it because the soil was so dry that it was just falling out of the drainage holes and then it dropped a leaf the very next day. Today same thing I watered it (7 days after first watering) because the soil was bone dry and then it dropped 2 leaves. I have it on a table near a west facing window that gets bright direct sunlight early in the morning and then shady light throughout the day. So my questions are: Have you ever seen these white wax like spots? Am I over/under-watering? Am I depriving the poor thing of sunlight? And a bonus question: Does she need to be potted up? She's in a 5 inch pot right now. 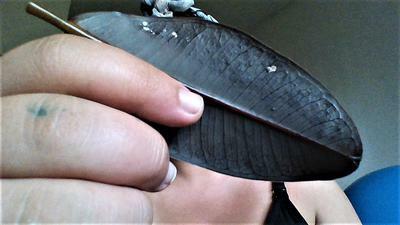 Interestingly, Ficus have sap that was used to make rubber, so it's no surprise that this looks like wax or rubber. Nowadays, ornamental figs like this one are not used for rubber production. They do tend to 'leak' or bleed if they're damaged, in transit or after pruning for instance. Once you get it in the right place this will stop happening. I've learned never to move Ficus benjamina, a close relative because of the leaf drop problem. They soon make new ones to replace them, but it can at times seem like they're dropping more every day. It seems to be seasonal, as though they're going through an autumn. It sounds like you're doing everything right in the light department; they don't need intense sunlight, just fairly bright light. Morning sun is not as intense as noon or afternoon sun, so it should be fine in those conditions. For the water, if they're drying out that quickly, maybe it is time to repot them. It almost looks like there are several cuttings in the pot, a trick that commercial growers use to make it look bushier and more full. You can keep them all together, or separate them a bit in a larger pot, or separate them entirely and pot them up in several pots. Enjoy your gorgeous plant - it will be long lived with the right care.